Husband and wife Randy and Rachel officially launched East Coast Beef Jerky in 2014. Built on a foundation of excellence in product and customer service, East Coast Beef Jerky has quickly become a local favorite for all ages. 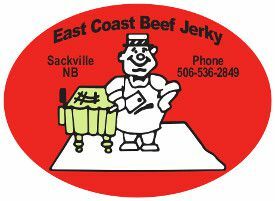 East Coast Beef Jerky has expanded to put their product in Moncton, St. John, Fredericton, Port Elgin and Shediac, and it continues to grow. Excitingly, East Coast Beef Jerky is currently developing two new flavors. Admirably, East Coast Beef Jerky offers a full money back guarantee for any purchase that does not meet the customer’s expectations. 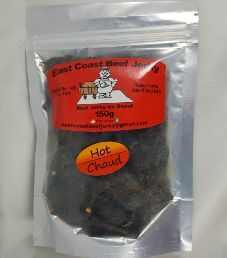 East Coast Beef Jerky is distributed under the same name of East Coast Beef Jerky, and it is located in Sackville, New Brunswick, Canada. The next review on East Coast Beef Jerky will be on a 5.3 ounce/150 gram bag of their hot flavored beef jerky. This jerky bag was kindly submitted for review by the owners, Randy and Rachel Johnson. The beef used from Alberta is not guaranteed to be free of growth hormones or additional antibiotics. Also, the beef is not guaranteed to have at least partial free range access to graze on grass. As a result, the highest ingredient rating that can be awarded is a Good (8/10) rating. The only liquid marinade used here is an unknown soy sauce brand. 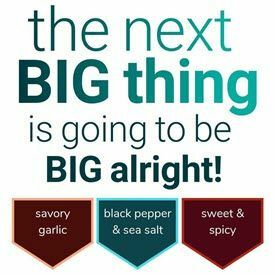 Some healthy ingredients are added such as anchovies, dehydrated garlic, dehydrated onions, mustard seeds, spices, and tomato powder. A rating is lost because the emulsifier polysorbate 80 is used that bind ingredients together. Polysorbate 80 is not considered to be healthy. The sugar level is acceptable at around 3 grams of sugar per 28 grams of jerky. The salt level is high at around 480mg of salt per 28 grams to lose a rating. Our preference is 350mg of salt or less per 28 gram of jerky. 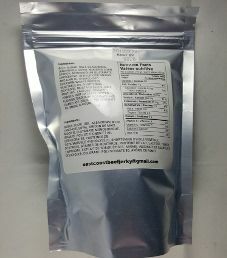 This jerky does qualify to have no sodium nitrite, or any other unhealthy preservatives. Instead, salt is the main preservative used. What can I say about East Coast Hot Beef Jerky? At the risk of repeating myself, I’ll let two of our own celebrity experts weigh in on this fabulous meat treat. Our first expert in the first corner, wearing the blue trunks towering at 5’8” and weighing an impressive 200Lbs and a few little specks of dust: Give it all up for Paul “The Rekking Ball” Rekker!!! When I open the bag, I am immediately greeted with a fresh, spicy and delicious aroma. 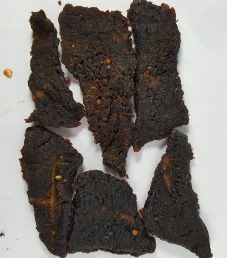 The jerky is sliced mostly medium in size and thickness. 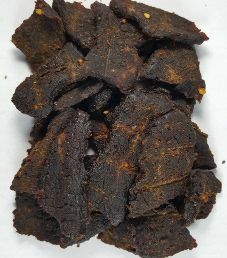 The jerky is soft and chewy and it leaves some oily residue on the fingertips. The appearance of this texture is dark and rich looking with a few hot chili peppers and mustard seeds scattered here and there, making me think that it is “ripe” with marinade. The first flavors I encounter are salt, pepper, garlic, some sweet (but not too much), and the unmistakable heat. This jerky is coming across exactly as advertised. Man oh man! I am just loving the spiciness of this jerky. Those East Coasters sure know how to make a solid tasting jerky, proving they’re more than just a one trick pony (most know the East Coasters as merely fishermen). Move over Alexander Keith’s, East Coast Beef Jerky may soon usurp you as the number one export from our eastern neighbors. I’m very comfortable giving this flavor a very enthusiastic 20/10. Oops, no can do apparently, so a 10/10 will have to suffice. Two (hundred) very enthusiastic thumbs up! In the opposite corner, our second expert is wearing the red trunks; he also stands at 5’8” and weighing at a devastating 110Lbs with his hair wet and his pockets full of change. Let’s put them together for Mark “Jerky Us” Jurrius!!! This jerky is the definition of a bold tasting flavor. There are a myriad of flavors that jump out, which blends into a sublime bliss. It does not take long for the spiciness to take notice. The heat level levels off at 2 out of 4 on the heat scale. What kind of blows me away with this flavor is how I keep on inadvertently catch myself reaching for another strip of jerky from the bag without even really noticing. So much for saving some of this jerky until tomorrow, it’s as if I am powerless to stop myself from eating more of these strips. As for Yours Truly, I do share the same sentiments. I am elated with this mind blowing jerky from its fragrant and inviting aroma, this jerky is bursting with flavor and its rustic texture really put the cherry on the sundae, it certainly has it all. This jerky is like crack on steroids. I’ve opened my bag and I feel like Lindsay Lohan holding a rolled up Ben Franklin while “Hoovering” over a nice big pile of Coke or Tony Montana and the World is Mine! I chewed a few strips, my mouth is burning and I just can’t put the bag down. This jerky is Addictive as Heck. It hits all the right notes, at the right time and the right place in taste, texture and aroma. We’re all unanimous and without a doubt, this East Coast Beef Jerky Hot Beef Jerky easily earns an Excellent 10/10 taste rating. PS. To whomever disagree with this simple fact of life! I’ll only say this: “Time to go back to school, by”! A 5.3 ounce/150 gram bag of jerky sells for around $12.00, which works out to $2.26 an ounce. That would rate as a cheap price. Some bag categories missing are allergen alerts, and a blurb printed about East Coast Beef Jerky. No web site is available yet, but is forthcoming. You are encouraged to follow East Coast Beef Jerky on Facebook. Commendably, a phone number and email address is provided for customer inquiries. The information in the bio of East Coast Beef Jerky is false. Randy Johnson and I, Tracey Johnston, started this business and registered it in 2014. I gave my interest in the business to Randy in 2016, which is when Rachel Jones came on, not 2014 as stated. Just wanted to ensure you have the correct information on this business.